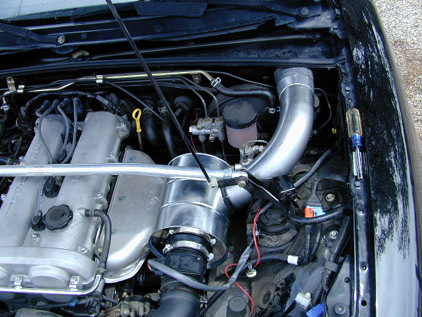 Also check out Dan's Cold Air Box for more inspiration! Due to concerns that K&N style intakes don't filter as well as traditional paper filters, I've redone the intake using the stock filter from a 1988-1990 Honda Prelude thanks to a suggestion by Cliff Knight. 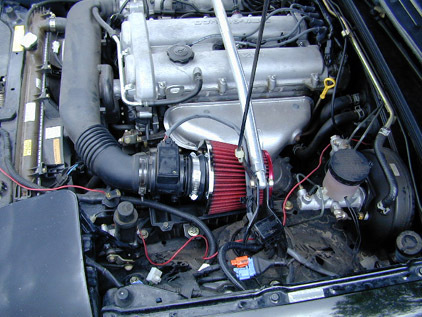 This filter is a conical paper filter that you will find remarkably similar to a K&N in basic shape and should still flow better than the stock Miata box. Because I had to make a new can to hold the new filter, I also took the easy way out with the cold duct and used a flexible dryer exhaust pipe. I avoided this in the original design because I was worried about the ridges slowing down the air flow and I still feel that this does occur. If I get bored some day I will probably make a new smooth cold air tube. If you are power hungry at all costs you will want to stick with the original design. The smooth intake tube and the free-flowing oil-cotton filter simply flowed better and was more powerful. The new setup is still way better than stock though since intake temperatures are lowered just as much. Along with a reflective heat wrap, real scientific data has ben collected regarding the effectivness of this intake to bring cold air to the engine. If you just want the short version, click here. Otherwise check out all the details at the Intake Temperature Logging page! The annoying rattle/buzz/noise referred to on page 5 was actually the paint can lid resonating with the intake at certain RPMs. 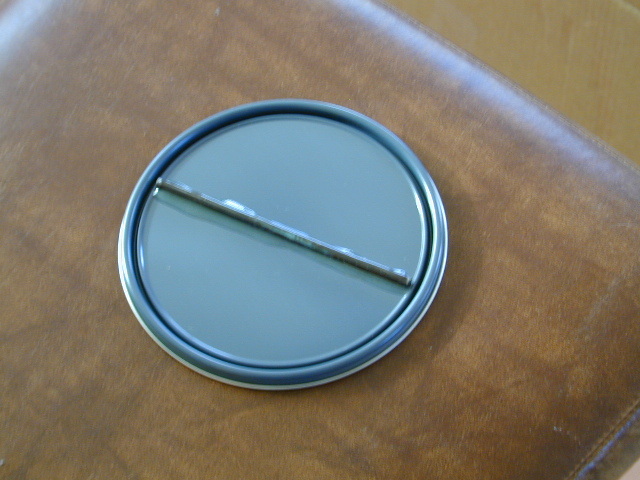 I have remedied this today by epoxying a steel rod to the inner surface of the lid. Also, quasi-scientific dyno hear-say indicates that this mod is worth around 5hp. Not bad when you consider that stock is 100hp, although still peanuts compared to a turbo. I initially tried this using 3 inch diameter PVC plumbing. However the 90 degree elbow I needed to use wouldn't fit between the shock tower brace and the brake lines. If you have manual brakes or no STB then you should be able to use PVC pipe okay. However the metal exhaust pipes look way better. I specifically didn't want to use a clothes dryer exhaust pipe because I figured the ribs inside them would slow down the air flow. If you do want to use dryer pipe there is a mind boggling array of options. Also roof gutter down pipes seemed to have some nice options, but again the bends had nasty air slowing ribs all over them. First things first, the cool looking cone filter I got from my local rice burner shop. I know it's cool looking because the first thing the guy at the store asked me was what color I wanted. I thought to myself, "Shouldn't you be asking me what size or brand I want?" Oh well. Upon examination it appears to be a pretty good quality piece of filter anyway so I bought one. The filter has a standard 3 inch outlet that you can clamp right onto the air flow sensor on the 1994-97! How convenient. You really don't even need any mounting hardware if you leave the lower half of the stock airbox in place. It rests in there quite nicely. Of course this may not work as well with other filters you find. Running with just the exposed cone filter felt pretty good, and sounded mighty good too. All the rice boys will like me as well when I open the hood on Friday night. But we're not satisfied with that. I need to cut a big hole in my firewall too!